One of Romanian professional tennis player is Simona Halep. She is the current world No. 1 on the WTA Tour at ranking which she first achieved in October 2017. She is being named the WTA's Most Improved Player at in 2013. She was also being named ESPN Center Court's 2013 Most Improved Player. She won her first major tournament at the 2018 French Open. In 2017, she has also won WTA's Fan Favorite Singles Player. In 2018, she was given the award of Cetatean de onoare of the city of Bucharest. Simona Halep is born on 27 September 1991 at Constanta, Romania, Europe. 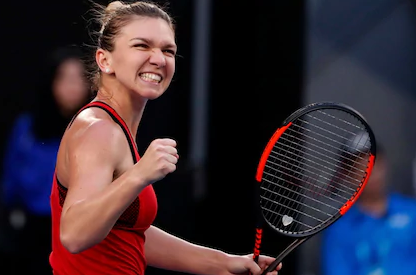 She was born to Stere Halep and Tania Halep. Her father was a former football player. He currently owns a dairy products factory in Romania. She has an older brother named Nicole Halep and sister Luminita. The family is of Aromanian descent. She received her early education from Junior High School and began tennis at the younger age. She had an interest in tennis when she was just 4. So at age of 6, she went for regular practice. Halep’s height is 1.68 m and weight is 60 kg. She has the black color eye and brown hair. During her teenage, she suffered a lot to play tennis due to her breast. So she did breast reduction surgery at the age of 18. She also explained that her weight makes her uncomfortable while playing tennis. Therefore, she has the balanced and healthy body. In 2008, she started in junior competition. At the Roland Garros Junior Championships, she entered the main draw as the 9th seed. She entered senior developmental ITF tournaments in the spring. She won two smaller ITF $10,000 tournaments in Bucharest. In 2009, she won at the ITF $50,000 tournament in Makarska. She made her first attempt to qualify for a senior Grand Slam tournament at Roland Garros. She also won the ITF $25,000 tournament in Maribor. She made to semifinals of the indoors ITF $50,000 tournament in Minsk, Belarus and ITF $25,000 tournament in Opole, Poland in November. In 2010, she entered the Australian Open but lost. On 5 April, she was ranked 166 in the world. Her breakthrough on the WTA tour occurred during the 2010 Andalucia Tennis Experience at clay court of Marbella. She was qualified for the 2010 Barcelona Ladies Open by winning 3 matches. She continued into the 2010 Grand Prix SAR La Princesse Lalla Meryem in Fes. In May, she was qualified for her first ever Grand Slam main draw at French Open but later she was defeated. In August, she was qualified for the main draw of the US Open but later she lost. In January 2011, she reached the quarterfinals in the 2011 ASB Classic. At the 2011 Australian Open, she was qualified for the first time in her career in the third round of a tennis Grand Slam on seniors but later she lost. In April at the 2010 Grand Prix SAR La Princesse Lalla Meryem, she got defeated. At the 2011 French Open, she lost the match. For the 2011 BCR Open Romania Ladies, she was top-seeded. At the 2011 US Open, she was placed in the main draw. At the BGL Luxembourg Open, she got lost. In 2012, she lost at 2012 Australian Open. She then made it to the third round of the 2012 Indian Wells Masters and the 2012 Miami Masters. She played at the 2012 Brussels Open in a tune-up for the 2012 French Open. She made to the semifinals of the WTA Premier event. In 2013, at the French Open, she suffered her second successive first-round exit at a Grand Slam. At the Budapest Grand Prix, she was defeated. She reached the final of the WTA Tournament of Champions which was her ninth career final and sixth of the year. She was ranked No. 11 in the world. In 2013, she won the award WTA's Most Improved Player of the Year. In December, she was also named ESPN Center Court's 2013 Most Improved Player. In 2014, she played at Sydney International in January, where she was the number 7 seed in a draw that contained 6 of the WTA's top 10. She was in the Australian Open, where she was the number 11 seed. On 16 February, she competed in the final of the Qatar Open in which she won in straight sets to win her first ever Premier 5 tournament. She rose to number 5 in the world, becoming the highest-ranked Romanian in the history of the WTA. She entered the French Open as the number 4 seed and dropped just 11 games. She is also the first player in the Australian Open to reach her first Grand Slam final without losing a set. In 2014, Bucharest Open she won the final in straight sets as her second title of the year. She rose to second in the world rankings. She won her first ever WTA Finals match. In 2015, she played at the Shenzhen Open where she was the top seed, winning her ninth WTA title. She played at the Australian Open, where she was seeded 3rd. She won her tenth WTA title in the hardcourt event at Dubai. She regained her No. 3 WTA ranking. During the grass season, she reached the quarterfinals in Birmingham. At Wimbledon, she was one of six seeded female players to be knocked out in the first round. She became the second player to qualify for the Singapore 2015 WTA Finals. She was seeded No. 1 in the 2015 WTA Finals, and she started very well with a victory. She was at No. 2 position in the WTA rankings. She ended the season with her best ever year-end ranking. She won three titles. In 2016, she was in the Sydney tournament where she reached the semifinals. At the Australian Open where she was seeded second. In the Fed Cup, she lost her first match. Being defending champion at the BNP Paribas Open, she was seeded 5th. She was being named in Romania's team for the Fed Cup World Group Play-offs. At the French Open, she was defeated. In the 2016 US Open, she lost at last match. In 2017, at the Shenzhen tournament, she lost in second round. In the Australian Open, she lost in first round. In 2017 St. Petersburg Ladies' Trophy, she was the first seed of the tournament. In French Open she was seeded third. She lost the match at the final. At the 2017 US Open, she lost in the first round. She was ranked the WTA world No. 1 for the first time. She became the seventh player to reach the no. 1 ranking without having won a Grand Slam tournament. In 2018, at Shenzhen Open she won her first WTA doubles title at the tournament in which her partner was Begu in final. At the Australian Open, she got defeated at the final. She reached the semifinals in Indian Wells. She reached the final at Rome in a rematch of last year's final but lost in straight sets. At the French Open, she got defeated at final. Halep is a married woman. She married to Horia Tecau who is also the Romanian tennis player. They married at the secret ceremony in which they involved their family and close friends. The couple has a daughter as well. Hale’s net worth is estimated to be $14 million. She has made around $18.5 million from her prize money in the total career. She also earns from endorsement amount. She has the sponsorship deal with famous brands like Adidas, Wilson and many other Romanian brands.